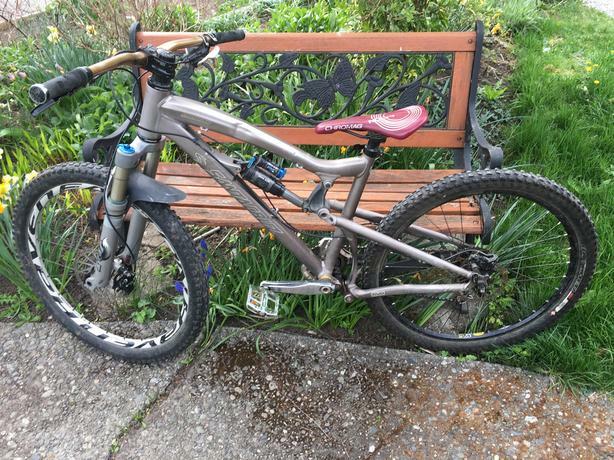 For Sale is a 2008 Medium Santa Cruz Nomad. The bike has seen its fair share of use over its lifetime but is a truly classic mountain bike which pushed boundaries upon its release and has a lot more to offer for someone looking to get into the sport or ride more aggressive terrain without breaking the bank. The past three years it has been sparingly and lightly lady ridden and was well maintained over the course of its life. It's a bit of a franken-bike with mixed and matched wheel and brake sets, however, all components were high end at their time of purchase. It has a sizable dent in the top tube but this has existed for years and doesn't affect performance. While not mine, I am posting this for a friend. Further, this bike has stayed in the "family" as I personally know all 3 owners of this bike since purchased a decade ago. Let me know if you have any questions or want to pop by to take a look. Don't miss the prime spring dirt, buy this thing! Price is OBO.